Have you or a loved one been charged with possession of drug paraphernalia in Tulsa or another Oklahoma community? Under Oklahoma criminal law, there are numerous items considered to be “drug paraphernalia.” If you are arrested with glass pipes, rolling papers, plastic baggies, syringes, hypodermic needles, metric scales, bongs, torch lighters, spoons, cut straws, razor blades, methamphetamine manufacturing equipment, marijuana cultivation equipment, or a long list of other items, you will be charged with possession of drug paraphernalia. It is also illegal to sell these items under Oklahoma criminal statutes. Drug paraphernalia charges are usually filed along with other misdemeanor or felony drug charges, but a paraphernalia charge can be filed without a companion drug charge. It is important that you contact a Tulsa Drug Paraphernalia Defense Lawyer as soon after you are arrested as possible. Possession of drug paraphernalia in Tulsa, Oklahoma is a misdemeanor, with the maximum penalty for a first offense being one year in the county jail and a fine of $1,000. A second drug paraphernalia conviction carries a maximum of one year in the county jail and a fine of $5,000. A third or subsequent offense carries a maximum of one year in the county jail and a fine of $10,000. However an individual who is eighteen or older and sells or delivers drug paraphernalia to a minor, a person under eighteen, faces a felony charge with a maximum of two years in prison and a $1,000 fine. “Delivery” can be as simple as passing a marijuana pipe or other paraphernalia from one person to another, and does not require any type of sale or transaction to occur. 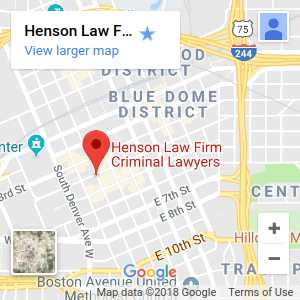 The Henson Law Firm has defended countless individuals facing drug paraphernalia charges and is extremely capable and knowledgeable regarding paraphernalia defense. The drug paraphernalia defense attorneys in Tulsa can fight for the best outcome in your case by preventing a conviction from staining your record, reducing your fines, protecting professional licenses, and avoiding jail time. People often wonder why they should hire a drug paraphernalia defense attorney if they are “only” facing a misdemeanor. Never proceed in any criminal matter without legal representation, even if it is “only” a misdemeanor. The results could be disastrous to your career, your professional license, and even your freedom. If you or a loved one is facing a drug paraphernalia charge, it is extremely important that you contact the Henson Law Firm as quickly as possible in order to begin protecting your record and fighting the case. Need a Tulsa Oklahoma drug paraphernalia defense attorney? Contact us today!